The 1910s in America were filled with sentiments of reform. It was the end of the Progressive Era that brought social activism and political reform into the culture. This film displays, for one of the first times in cinema, the ability of the medium to expose substandard conditions and injustice. Of course, it “sells” these idea through the conventions of the stage melodrama, and through that, the Dickensian superpathos of the poor, including the traditional child-crucifixion, in which a helpless youngster dies, primarily in order to serve as a rebuke to society’s neglect. Shot by the short-lived Thanhouser Company of New Rochelle, NY, the dramatic short gives us the squalid lives of a working family whose life is only lit by the presence of the youngest child, Little Alice. (Little Alice evidently stays alone in the wretched hovel they call home, winsomely dusting whilst the clan toils.) The wife of the rich, ruthless mill owner sees Little Alice and wants to adopt her for cash. No dice, says the tyke. When the mother becomes ill, the youngest must work in her place at the mill, and the danger and drudgery drives her to the mill owner’s mansion, where she begs to be adopted. But no! They got a cockapoo instead. Little Alice goes back to the mechanical looms, where she quickly expires dramatically, downstage center. On the way back from the funeral, Little Alice’s mother berates the mill owner’s wife as she and her husband drive past the unfortunates. Little Alice’s family is somewhat comforted by an angelic vision of her, but in their palatial mansion the mill owner’s wife is stricken with conscience. A quick, masterful set of dissolves shows her, the mill, a relay of the child’s death, the funeral procession, and back to the rich couple. It’s conventionally shot otherwise. James Cruze, the future director of many silents, stars as the father and Little Alice was played by Marie Eline, whom the studio was trying to build up as a celebrity, the Thanhouser Kid. 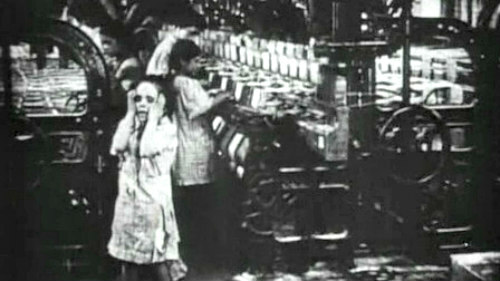 The strangest parts of the film turns out to be the scenes filmed inside or in front of an unidentified factory. It’s easy to tell the actors from the workers by the pancake makeup used, and the intermingling of reality and narrative is odd, especially as the film is an indictment of such factories. Maybe the novelty of it lowered the owners’ guard. At any rate, there we are, watching as the characters work the actual machines. Everyone eaves the factory at the end of the day, the actors shuffled in among the people they are supposed to be portraying. It won’t be the last of film’s Alice-in-Wonderland moments. It's instructive that, despite her sorrow at the death her husband's factory causes, the mill owner's wife does nothing. It’s heavy-handed, as much “muckraking” non-fiction and fiction by the likes of Upton Sinclair and Frank Norris tended to be. But it provides no solutions, no plan of action. The poor are to be pitied, and that's about it. Progressives and crusaders loved it; Woodrow Wilson cited it in his 1912 campaign. However, child labor wasn’t outlawed until 1938, and is still largely legal in the agricultural industry.